Redwolf Airsoft is the Exclusive Distributor of RS products for the UK, Hong Kong and parts of Europe - Check out their NEW products! RS, an abbreviation for Real Sword, are the new kid on the airsoft block, and from what we have seen of their upcoming products, we are quite confident that they are here to stay. They are a Hong Kong-based company with a fresh approach, and this is readily apparent in their soon-to-be-released first products - the first guns that they will be releasing are replicas of Chinese assault rifles: the Type 56, Type 56-1 and the Type 97, and the end product is quite simply astounding. A lot of time & effort was spent ensuring that each model is, in terms of aesthetics, a perfect replica of the real steel counterpart. Thus, these AEGs are as close you can get to the feel and look of the real thing, thanks to specially developed 7mm gearboxes which allow for a 100% real steel dimension. For the Type 56 & Type 56-1 AEGs, the manufacturing and chemical treatments are done in exactly the same way as the real steel equivalents by RS's factory - making for an incredibly real looking product. Even the spot welds and other minute details that you might think are irrelavant, are made relevant, and very meticulously so in this case. Of course, RS's guns look extremely real but can never be converted to fire real bullets. In essence, RS guns are so realistic that they are the equivalent of PTW's. Redwolf Airsoft is honored to be appointed as Official Distributor of RS products for Hong Kong, the United Kingdom, and parts of Europe. The first load of products will be coming out very soon, so keep your eyes permanently peeled. We tested and inspected their new guns at length and they are VERY high quality. The external finishing, weight, method of manufacturing, and even the smell are exactly like the real thing. RS guns are designed to be more like PTW's and are extensively used by military organizations for training. For many who have never seen the standard assault rifle used by the Chinese military - the TYPE 97 - this is the best chance to get the real feel for it. 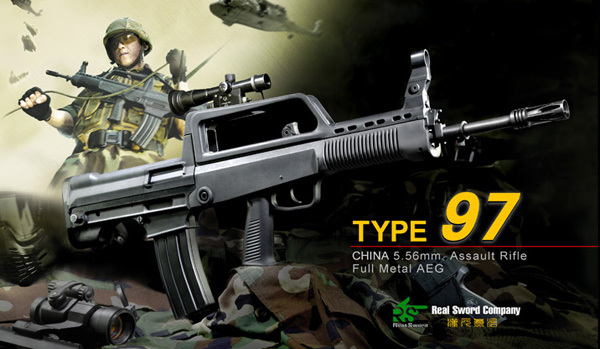 RS's Type 97 is EXACTLY like the real thing dimensionally and operationally. You cannot tell the difference between the real version and this airsoft version until you pull the trigger!